Forget brains, brawn or beauty, when I was in primary school, social status came down to one factor: whether you had the Grease 2LP soundtrack*. The passage of time now adds a double layer of nostalgia to Grease: a return to the vitality and promise of the burgeoning youth of the 1950s along with fond memories from late 1970s and early 1980s of the release and elongated cinema season of the massively popular movie musical itself. But before going any further, I must make a confession. 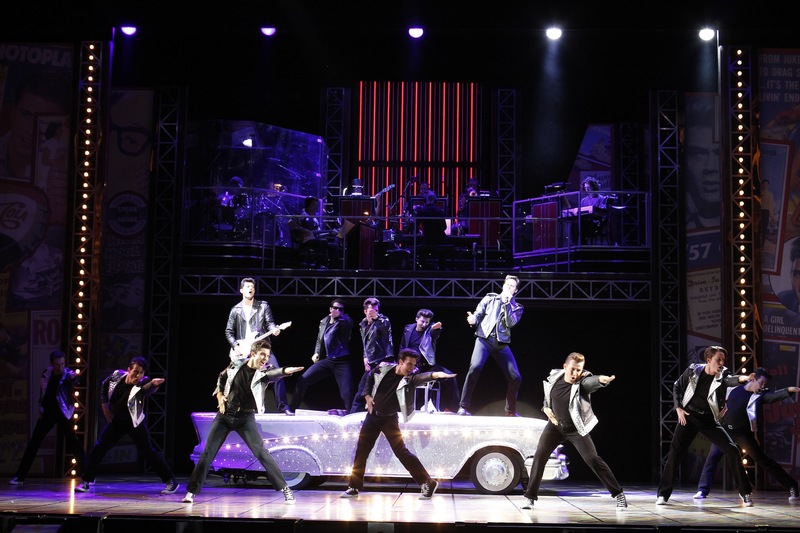 Until today, I have actually avoided ever seeing Grease on the professional stage. Apart from its previous Australian seasons, it has been playing, at times, in Broadway and the West End when I have been there and I have given it a wide berth. So what is the difference this time around in 2013? The answer is the amazing cast. Producer John Frost has attracted a terrific collection of Australia’s most talented young theatre performers and iced the cake with some delicious cameo appearances. 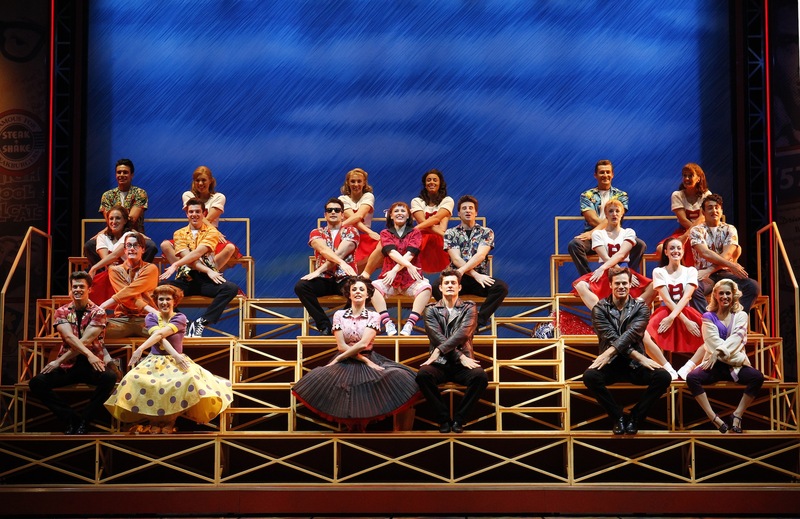 Promoted as the Number One Party Musical, the festivities kick off in the Sydney Lyric foyer, decked out in Rydell bunting and life-size cardboard cast pictures for photo opportunities. Pink drinks and themed treats are for sale at the recently enlarged foyer bars. The fun starts in the auditorium before curtain with Bert Newton back to his roots in the radio booth as DJ Vince Fontaine. Our Miss Lynch, played by 1980s soap icon Val Lehman, runs some 1950s-style karaoke audience warm up, with requisite Prisoner reference thrown in for diehard Wentworth tragics like me**. The other two guest stars are saved for act two, when Todd McKenney brings down the house crooning Teen Angel’s “Beauty School Dropout”. Anthony Callea sings up a storm playing himself Johnny Casino at the High School Hop. 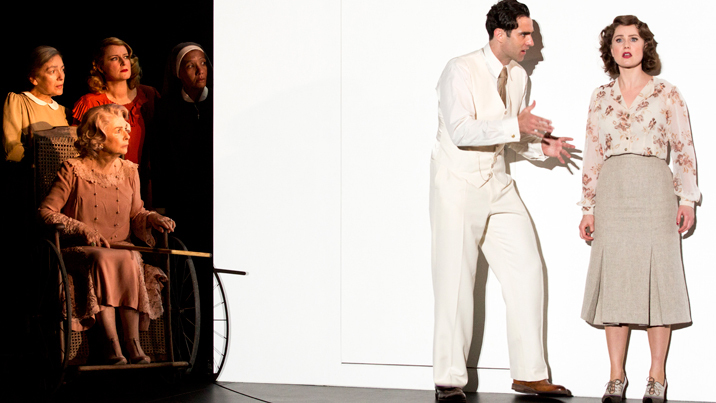 This London revival was put together by some of the cream of world theatre practitioners. Terry Parsons’ set design cleverly evokes a high school sketchpad, with backdrops looking like they have been coloured in with Derwent pencils. Panels of 1950s ephemera frame the action, with plenty of embedded lights added to the colour and sparkle. The non-naturalistic sets allow for an effortless flow, although it also tends to show up the comic strip nature of the wafer thin plot. The book has been streamlined so much that it almost relies on audiences’ prior knowledge of the story and characters almost as much as King Kong does. Costumes are by the legendary Andreane Neofitou, the original, and ongoing, costume designer for Les Misérables. Neofitou has paid homage to the most well known looks in the movie as well as livening up the period look with a fresh, multicoloured palette. Compared to the modern music theatre style, where songs and story development are distinctly enmeshed, Jim Jacobs and Warren Casey’s score is basically a catalogue of charm songs. Each one is delightful but none propel plot or character. 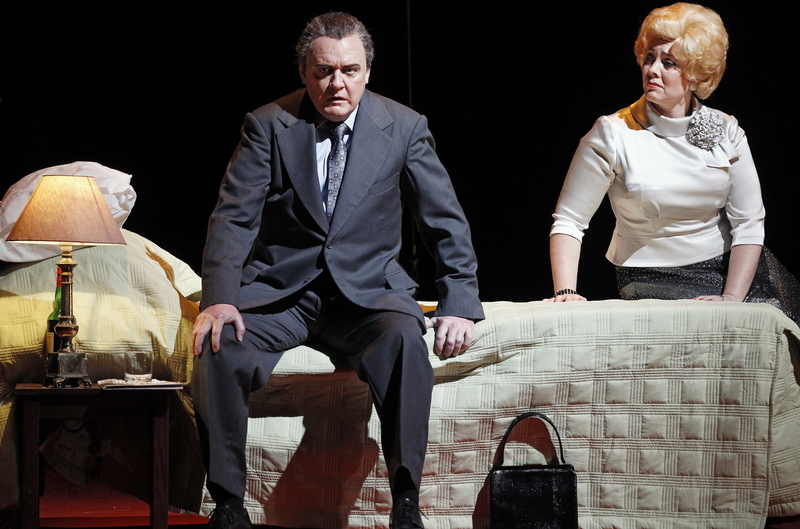 Taking a cue from Rob Marshall’s Chicago, Director David Gilmore has staged almost every song like a dream, a device Marshall conceived to aid cinema audiences no longer used to characters bursting into song. This seems an odd choice given that theatre audiences are surely already suspending disbelief enough to cope with characters singing in a musical. 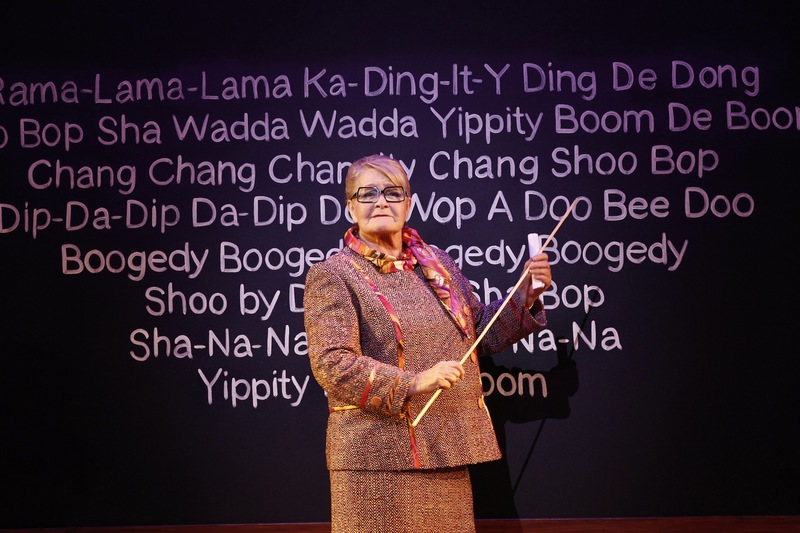 Some of the Arlene Phillips’ best choreography (recreated here by Charlotte Bull) is danced at the Hop, with dancing throughout the show characterised by tight, highly energetic moves that are as much fun to watch as they must be to perform. Energy is at fever pitch throughout the show and comedy is extremely well handled. Kudos to resident director/choreographer Natalie Gilhome for keeping the company at peak performance levels. The party concludes with an extended megamix that leaves the audience cheering and on a high. As a stage performer, Rob Mills has come such a long way since stepping out on the Regent stage for Wicked previews back in 2008. Now a suavely assured, confident performer, Mills matches his matinee idol looks with a killer voice with a propensity for physical comedy thrown in for good measure. 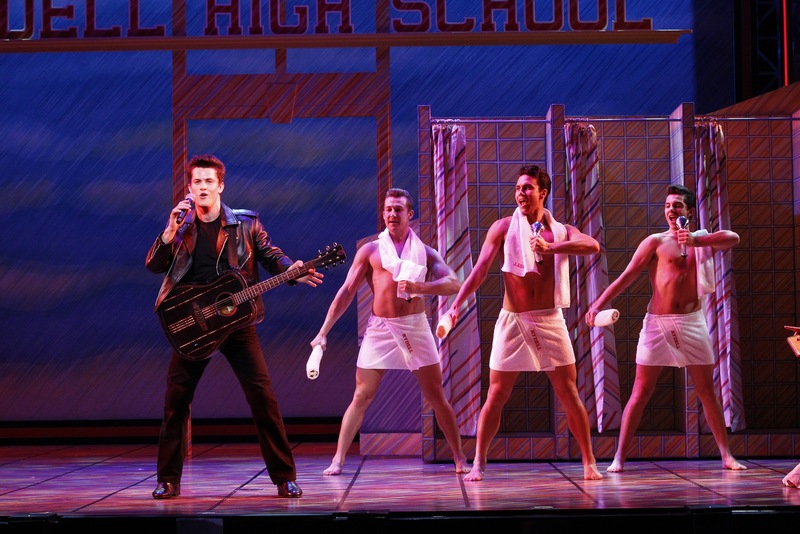 He is certainly better used here as strutting leading man Danny Zuko than as one-note pretty boy Warner in Legally Blonde. Relative newcomer Gretel Scarlett is an endearing as naïve good girl Sandy, her lovely music theatre singing voice augmented with some gorgeous soprano head voice ornamentals at times. Experienced music theatre actress Lucy Maunder, enhances the choice role of Rizzo with the depth of her vocal and acting talent. Entrusted with the one serious moment of the show, Maunder absolutely nails it, soaring through “There Are Worse Things I Could Do” and having us completely on Rizzo’s side. 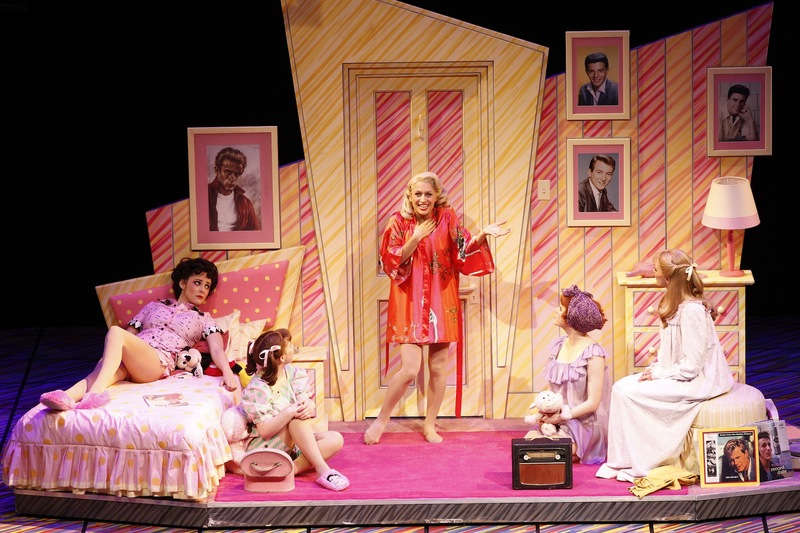 Likewise, the Pink Ladies are in more than capable hands with Francine Cain (Frenchy), Laura Murphy (Jan) and Karla Tonkich (Marty) all delivering sharply defined, enjoyable characters. 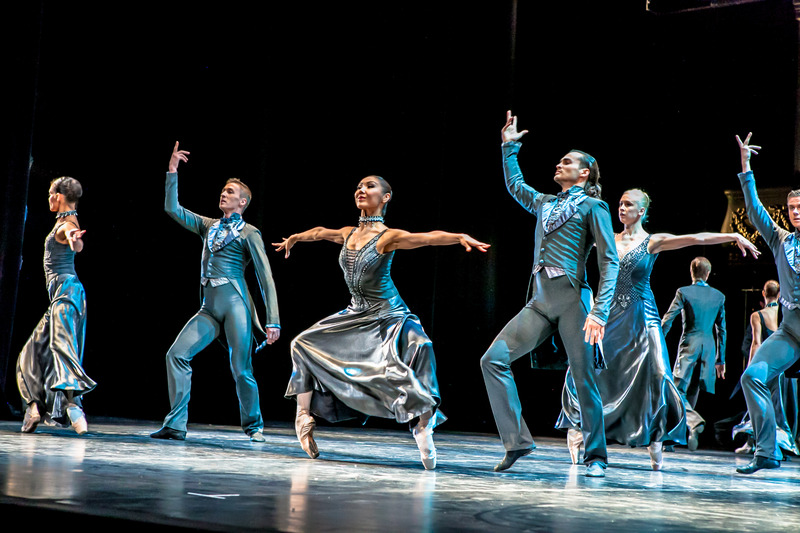 An extra credit to each of these leads that their dancing skills are on par with the ensemble, meaning that full company dance numbers are quite spectacular. 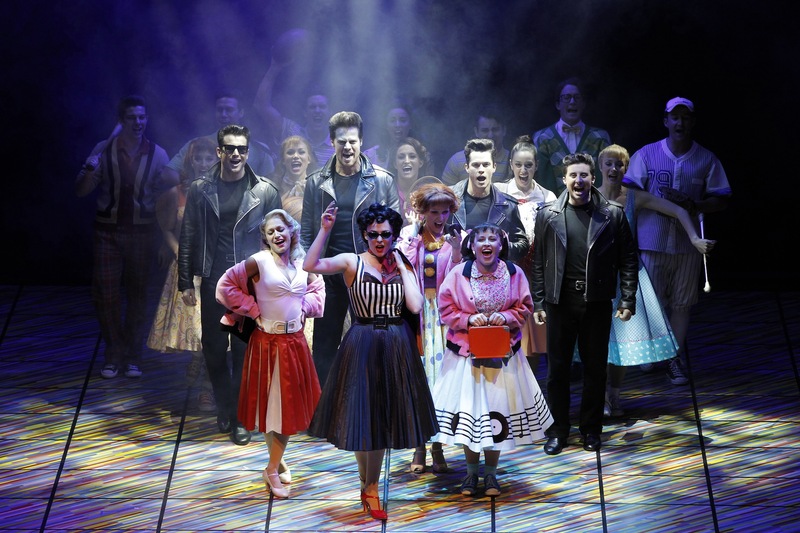 Grease continues at Lyric Theatre, The Star, Sydney until 22 December 2013 before opening in Melbourne on 5 January 2014. Love Grease, so would love this!!!! Amazing 4 star musical, 5 star review!! !